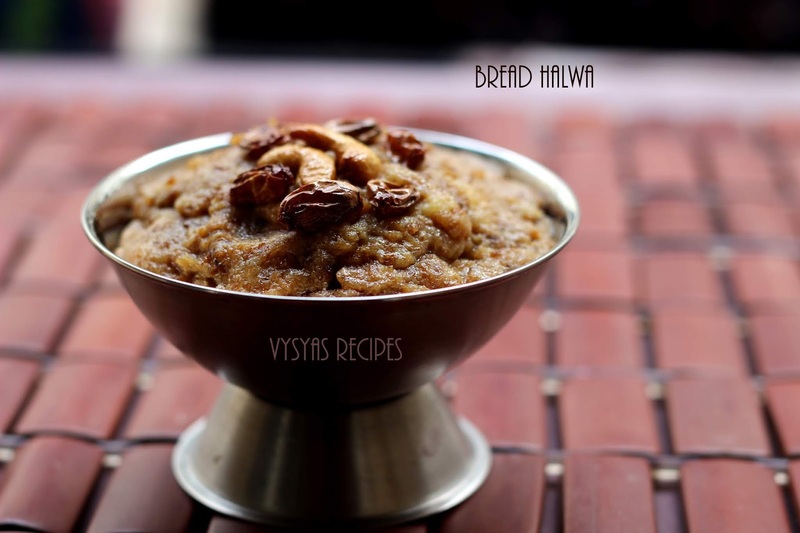 Bread Halwa is an Easy Diwali Sweet Recipe made with Bread slices. Cubed breads are roasted in Ghee, till aromatic, then simmered in milk & Sugar & cooked till it gets halwa Consistency. This Halwa can be made with left over bread also. Sweet Bread or Milk Bread can be used to make this Halwa. it just Melts in Mouth. Cardomom Powder - 1/8 tsp. Heat 4 tbsp of Ghee in a Pan, add Cashews.When cashews changes the Colour slightly, add Raisins. Saute till Raisins bulges its size.Then remove Cashews & Raisins from Pan & keep it aside. Now add cubed bread. Saute till it turns Golden. Now Mash lightly & stir Continuously till it gets halwa Consistency & it leaves the sides of kadai. Add Remaining Ghee, Stir well. Now add Cardomom Powder, fried Cashews & Raisins. Mix well. Serve Bread Halwa, hot or Cold. Adjust Sugar according to the type of bread you use. you can make this Halwa with Brown bread or Multigrain bread for healthy Option. you can slice & fry the almonds in ghee to add it .